For everyone interested in learning how to drive, the first driving lesson is an occasion you will surely be looking forward too. This guide contains tips for your first driving lesson, advice on what to expect from the lesson as well a list of things your driving instructor is likely to get you to do on your very first driving lesson. There’s nothing quite like the range of emotions a new learner goes through the night before their first driving lesson. A combination of joy, excitement, nerves and fear all rolled into one and it’s no surprise lot’s of new learners find it difficult to sleep the night before. For most people their first driving lesson signals the start of a new chapter in their lives and whether you’re taking this step the day after your 17th birthday, or you’re starting this journey a little later in life, the range of emotions you feel will be no different. If it’s your first time getting behind the wheel, you’ll surely be wondering what to expect from your first driving lesson. The vast majority of learners can expect to learn about the car and how to operate what can be a dangerous machine, you can expect to make mistakes over the course of the lesson and hopefully you can expect to feel motivated by the end of it, to tackle the challenge that is learning to drive. What Do You Do On Your First Driving Lesson? It’s important to understand what you are likely to do on your first driving lesson, as this will help settle your nerves and also give you a realistic expectation of the entire process. A majority of your first lesson will be spent going over the key components of the car. Your instructor will explain how the pedals work, where the gears are, what the relationship between the two is and he or she will also go through a safety check with you, known as the cockpit drill. You’ll learn how to set your mirrors, how to start the car and you’ll be asked to memories the POM routine, which is a routine you go through before moving the vehicle. Location wise, most first lessons are spent in either an industrial estate, large carpark, spacious field or quiet residential street. Busy roads and major high streets are avoided, as these can be too dangerous for new learners. It’s standard procedure for instructors to take new learners away from the busier parts of town, to allow them time and space to get used to the vehicle. Literally and figuratively speaking, first lesson are normally quite slow. In most cases your instructor will spend a significant amount of time talking to you about the car and when you do finally move the vehicle, you’re unlikely to be allowed out of second gear. Most new learners are raring to go by the time they’re behind the wheel and not being allowed to go over 20 miles an hour can be frustrating, however it’s standard protocol to be cautious during the first lesson, but rest assured, as your tuition progresses and you familiarise yourself with the car, you’ll be given more freedom on the road. You’re first driving lesson is normally a step into the unknown and it’s the feeling of not knowing that gives way to fear and nervousness. The first part of this guide was written to help clear up some of the unknowns by showing you what to expect on the day, while the second part of the guide has our top tips to help you make sure the day goes as well as it can. Driving requires your full attention and utmost concentration, therefore it’s important to get a good night’s sleep the day before. An early night ensures you are alert and focused once the lesson begins, meaning you’re more likely to understand and remember the new concepts you are taught during your lesson. It really is important to start your first lesson with a positive mindset. Learning to drive is a challenge and aside from the day you take your driving test, the challenge is never bigger than during your first lesson. Undoubtedly you’ll make mistakes and you may struggle to grasp some of the concepts you’re taught, however it’s all part of the process and you shouldn’t be too hard on yourself. A positive outlook will ensure you don’t get down should you make errors, or find it tough going as the lesson progresses. It also important to remember that any feelings of nerves, stress or worry that you have during your first lesson, will slowly start to disappear as your tuition progresses. The thought of getting behind the wheel can cause a new learner to panic and in truth, it can be a frightening prospect, however it’s worth remembering you have a fully qualified driving instructor alongside you, who is there to guide you throughout the lesson and intervene if in the unlikely event, you endanger yourself or another road user. 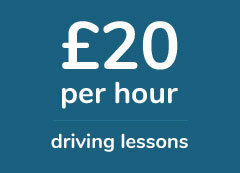 The vast majority of new learners will feel nervous on their first driving lesson. If the thought of getting behind the wheel makes your palms sweaty and causes your heart to beat just that bit quicker, you shouldn’t worry too much as it’s a feeling which is common and to be expected. You can reduce this feeling by watching videos on YouTube of other first lessons, by talking to your driving instructor for a few minutes before you get behind the wheel and by reading some of the other articles we have in our Learning to Drive section. The day of your first driving lesson will be an exciting day and although it’s normal to be nervous just before you start, it’s important to understand that in no time at all, you’ll be natural behind the wheel and any feelings of worry will be firmly in the rear view mirror. If you’re thinking about booking your first driving lesson and would like some advice, fill in the form below and one of our friendly team will get back to you shortly.